SQL Server Express can be used instead of larger deployments of SQL Server, depending on your company’s requirements. Database configuration and setup described in this article can be followed, but by default, the server is not accessible over the network. Follow these steps to make the server visible so that you can connect to and configure the server from another workstation on the network. Note: At Your Service Software, Inc. will not provide support for installing or administering SQL Server on your hardware and network. Please consult a local IT service provider and/or Microsoft for this service. 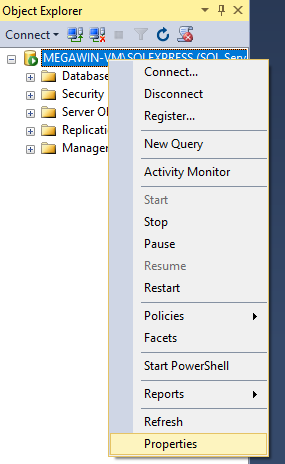 After installing the software, launch the SQL Server Management Studio on the machine hosting the SQL Server. Connect to the server instance. You should see the database in the Object Explorer on the left side of the window. 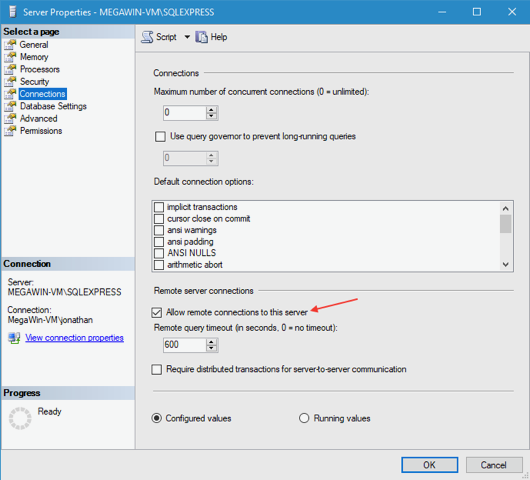 Right-click on the server name and instance and select “Properties”. On the Connections page of the properties, check the box labeled “Allow remote connections to this server” and click “OK”. You may need to restart the SQL Server. From AYS, choose File – Open Database – Microsoft SQL Server Database… and enter the Server Name, User ID and Password. If you installed the server with the default instance name, you can enter the IP address of the server in the Server Name field.